Olbrzym & Kurdupel are a jazz band from Poland. They play freely improvised music. The duo was created in spring 2007 in Gdynia. The music they play is simple, uninfluenced improvisation. The composing is identical to the first and only performance of that piece and it is unique. The priority of OiK is giving concerts and the publishing is only the documentary recording of all the stages of their creative work. On the stage the musicians are accompanied by the VJ who creates visualizations under the influence of music displaying them on the instrumentalists. During this musical and visualizing performance the band members wear white overalls. The light reflected from the figures of the artists gives the impression of three – dimensional image, and the musicians become “transparent” thus music and vision are given space to play the main role. At the beginning of 2008 the band recorded the first cd titled “frrrr…” that have collected numerous comlimentary reviews. 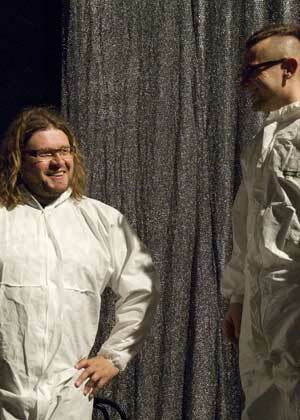 In April 2012 their second cd titled “SIX PHILOSOPHICAL GAMES” was published by “Fonografika”. The record met great acceptance in whole Poland and was enthusiastically reviewed in the country and abroad. The official premiere took place in the Musical Theatre in Gdynia where the band was accompanied by the orchestra. The concert was recorded audio and video – the material is being prepared to be published. The enterprise that was unquestionable success will be continued in the future as other concerts with orchestras. OiK achieved a very strong position at the polish improvising scene with its uncompromising, fresh and avant-garde work. It can be noticed mainly through many invitations to festivals of improvised music: “Art of improvisation”, in Wroclaw; “OFF Jazz Festival” in Tczew. The duo cooperates with outstanding musicians such as Mikołaj Trzeska, Rafał Mazur, Keir Neuringer from the USA.